A football field can also be called a “football pitch” or “soccer field”. It is the surface for playing the game of football. The dimensions of the “soccer” or “football” field as well as its markings have to be as per the “Laws of the Game”. The surface of the football field can be artificial (as, for example, artificial grass) or natural, like a natural grass, usually chopped so it is short and so it is simpler to play football on such field. The “FIFA” “Laws of the Game” insist on all of the artificial surfaces for playing football on must be painted in green colour. The “football pitch” is usually made of grass (or turf) or same green, but artificial grass, or artificial turf. All of the line markings on the football field are strictly defined by the “FIFA” organization. Thus, if a ball on or if it is above the so-called “touchline”, but still within the borders of the football field and a foul committed over the line of 16,5 meters, then there is a so-called, again, “penalty area”. That is why a ball must cross the “touchline”, so it is out of play and this ball must cross the “goal line”, which is between the ‘goal posts” before the goal is scored. In case any part of this ball is still on or it any part or all of the ball is above this line, then the ball is still in play and it can be used for continuing the game. The football pitch must be of a rectangular shape. The longer sides of it are “touchlines” and the other opposite sides are called the “goal lines”. Both of the “goal lines” must be between 45 and 90 meters and they must be the exactly same length. Both of the two “touch lines” must also be of the exactly same length and they must be between 90 and 120 meters in their length. All lines must be equally wide and they do not have to exceed 12 centimeters in total. The corners of the football pitch are always marked by corner flags. The so-called “goals” are in the very centre of each of the “goal-lines” and they have two upright posts placed from the corner of “flag-posts”. The inner edges of these “flag-posts” must be 7,32 meters apart and the lower edge of the “crossbar” must be 2,44 meters above the playground. The “nets” are usually can be found behind the “goal” itself, but they are never required to be there by the “Laws”. The so-called “goal-posts” and “cross-bars” must be marked using the white colour and they all have to be made of metal, wood or another material, allowed by the “Laws”. The rules about the shape of these “goal-posts” as well as “cross-bars” are never that strict. A goal can be “scored” in case the ball crosses the “goal line” between the “goal-posts”, described above. The so-called “goal area” is the area, which is formed by the “goal-line” as well as the two lines on the goal-line 5 meters from the “goal-posts” and extending 5 meters into the football pitch from the “goal-line” and a line. Goal kicks and any free kick by the team of “defenders” may be taken from any place within this area. The free kicks, which are indirect are awarded to the team of “attackers” within the goal area must be performed from the point on the line, which is parallel to the “goal line”, the nearer to where an incident occurred, the better. These free kicks cannot be taken further than within the “goal-area”. The so-called “penalty area” is the one which includes the “goal-line” and other lines, which extend from it. These lines must be 16 meters from the “goal-posts” and extend 16 meters into the football field. This “penalty area” is the one where the goalkeeper has the right to handle the football ball and where a foul by a “defender” becomes punishable by a kick which is known as a “penalty kick”. The so-called “penalty mark” is the one, which is 11 meters in front of the very centre of the “goal” and this is the point, where all of the “penalty kicks” are taken from. The so-called “penalty arc” is the one, marked from the outside edge of the “penalty area” and from the penalty mark on a distance of 9,15 meters. 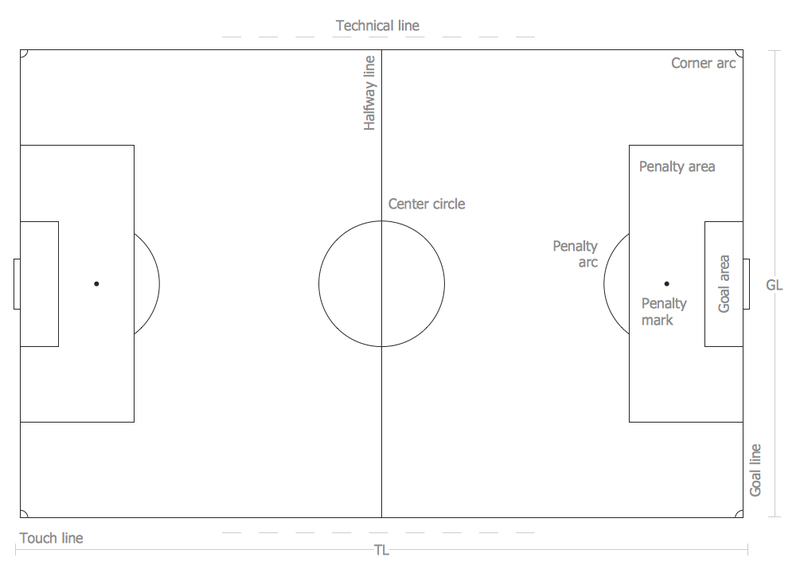 These dimensions, together with the “penalty area” mark an “exclusion zone” for all of the football players, but the “attacking kicker” and “defending goalkeeper” during a penalty kick’s performance. There is also a “centre circle” on the soccer football field, which is marked at 9,15 meters from the “centre mark”. It indicates the minimum distance which the opposing players must keep at so-called “kick-off” while the ball is placed on the “centre mark”. 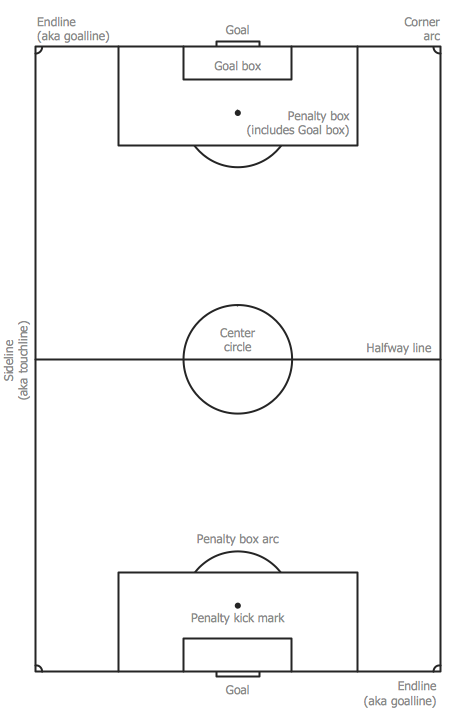 During the so-called “penalty shootouts” all of the football players, but both of the “goalkeepers” and the current “kicker” must remain within this “center circle”. The so-called “half-way line” is there on the football field for dividing the football pitch in two halves. One of the halves, which one of the teams defends, is commonly referred to being this football players’ team’s half. The football players must stay within “their” half while a “kick-off” takes place and they may not be penalised as being “offside” in “their” half. The intersections between the “half-way line” and the “touch-line” can be indicated with the flags, such as those marking the “corners”. The arcs in these “corners” denote the area where the ball has to be placed for the “from corner kicks”. The football players in “opposition” have to be 9,15 meters away during a corner. Also there may be optional lines “off-pitch’, which has to be ten yards away from the “corner arc” on the “goal-lines“ and “touch-lines”. These and other football rules, including the rules about marking the “soccer” (or “football”) field have to be taken into consideration in case you want to create a football field template. Or you can always simply use the Soccer solution from the Sport area of ConceptDraw Solution Park on this site or from ConceptDraw STORE application, as this solution contains many stencil libraries with predesigned vector objects as well as the templates of the soccer field plans. This Soccer solution can be used for making your own sport, including the football, field plans in ConceptDraw DIAGRAM and it provides all of the ConceptDraw DIAGRAM users with a wide collection of templates and examples to help the soccer specialists and fans draw any soccer-related diagrams and schemes within only a couple hours or even minutes. All templates from the Soccer solution are ready-to-modify. You can start from any template for your taste, change positions, add vector clipart from the libraries, text and get ready diagram in some clicks. The Soccer solution templates are so various in appearance and location of the soccer field that will be suitable for any case. 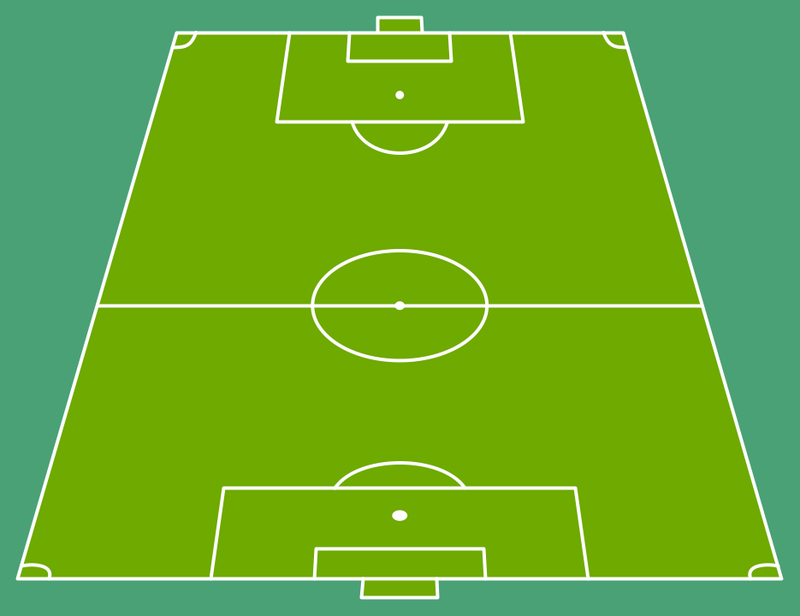 A set of predesigned fields and positions from the Soccer solution allows design the soccer diagrams without any drawing experience. 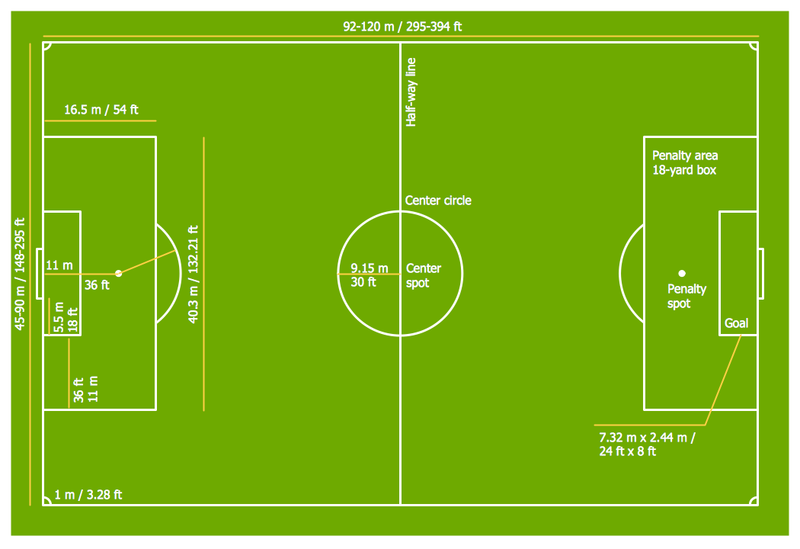 Adding the text you can mark the main zones and areas on the soccer field, as on the sample below. You can find in the Soccer solution the field located at different angles of view. So you can easy create the series of the soccer drawings from different points of view. This can be very useful for discussion the different formations and game situations. The samples you see on this page were created in ConceptDraw DIAGRAM using the Soccer Solution. They demonstrate the solution's capabilities and the professional results you can achieve quick and easy.